We’re in prime tomato glow-up. A quick stroll through the farmer’s market is all the proof you need. I rarely return from my Sunday shopping without a basket (yes, I carry an actual basket) overflowing with tomatoes of all varieties: big contorted heirlooms, plump Cherokee Purples, vibrant Green Zebras, and (my favorite) ruby red cherry tomatoes. With tomatoes at their peak, the possibilities are endless. Enjoy them simply, like this version drizzled with brown butter. Or stack into a towering BLT. You can make sauce, either no-cook or a low-and-slow version. Or, if you’re looking to preserve the fresh flavors of summertime, try tomato jam. My favorite way to enjoy my market haul: a casserole that magically tastes like the coziest combo, grilled cheese and creamy tomato soup. This best part about this cozy casserole is that it’s ridiculously easy to make. The pudding starts with a custard of eggs and half and half. To bump up the savory flavors, add a heaping handful of chopped herbs to the mix. Whatever you have on hand works, but I like basil, chives, and some thyme. Next, lots of cubed bread, tons of cheddar cheese, and a pint of halved cherry tomatoes mix and mingle. Once mixed thoroughly, dump it all into a big casserole dish and bake. It’s arguably easier than making a tomato soup and grilled cheese! Upon taking my first, slightly scalding bite I was immediately transported to my youth. The casserole tastes exactly like dipping a gooey grilled cheese sandwich into a warm bowl of steamy Campbell’s tomato soup. It’s a thing of beauty. 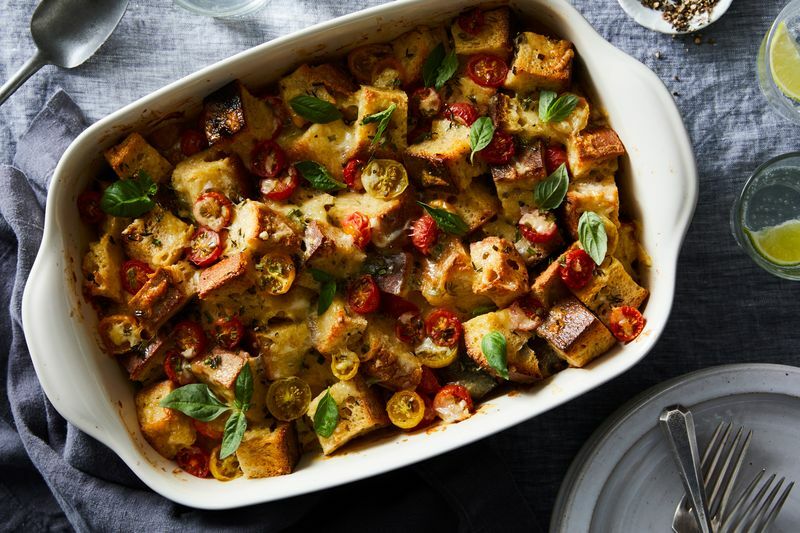 The top layer, golden-brown, buttery and crisp sits over a squidgy tomato-studded bread pudding. The bright tomatoes burst and char while in the oven, tasting almost like they’d been stewed. The gooey cheese glues everything together into a grilled cheese and tomato soup flavor bomb in each bite. Not only does this dish makes enough to share with a crowd, it’s fit for travel and make-ahead—perfect for any last-minute late-summer gathering or potluck. And feel free to use any kind of cheese of tomatoes you like, chopped heirlooms, halved Sungolds, or Romas. Whatever variety you’ve got in your basket will taste amazing. What’s your dream tomato dish? Share recipes in the comments below.